Millions of Americans take medication that is FDA approved, to “treat” their Alzheimer’s disease. The problem is the very drugs that are being prescribed to treat Alzheimer’s disease are actually associated with a more aggressive decline in cognitive function. Dr. Perlmutter says, “There is no medication that has any effect on the time course of this disease.” As a neurologist, Dr. Perlmutter has dealt with many families who struggle to understand the implications of Alzheimer’s disease. In 2015, his own father lost his life from this disease. “If there were a medication that helped, I would’ve prescribed it for my patients and father as well,” shares Dr. Perlmutter. It is beyond heart wrenching to recognize the incredible fraud that is being perpetrated across the country as it relates to Alzheimer’s disease treatment. 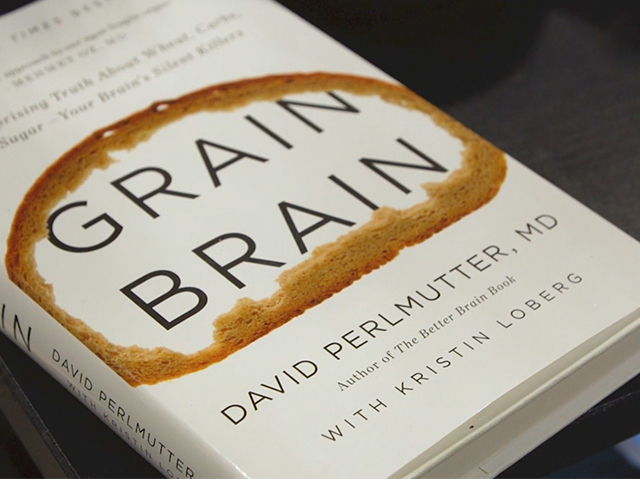 In 2013, Dr. Perlmutter wrote, Grain Brain, which quickly became a global phenomenon with more than 1 million copies in print and translated into 30 languages. The book’s success opened the door for him to travel globally, meet with top research scientists. In 2017, he shared his views on brain health at the World Bank a presentation that was broadcast to 150 sites around the planet. He feels it is important to educate the public on choices they can make to remain healthy. To maintain cognitive function and long-term health a non-GMO, gluten free and low carb diet is necessary. Inflammation - Gluten and a high carbohydrate diet are the most prominent stimulators of inflammation pathways to reach the brain. One reason people can’t understand brain inflammation is because the brain has no pain receptors, so you can’t feel inflammation in the brain. When you shift from relying on carbs to relying on fat (the good kind, no trans fats) and protein you will reap a lot more benefits including: losing weight effortlessly and permanently, gaining more energy throughout the day, sleeping better, being more creative and productive, having a sharper memory and safeguarding your brain. Fasting – provides the body with benefits that can accelerate and enhance weight loss and boost brain health. Intermittent fasting can stimulate the brain to turn to fat for fuel in the form of ketones (chemicals produced in your liver when you don’t have enough insulin to turn sugar into energy, so your body uses fat instead). Supplements – (1) DHA (omega-3 fatty acid) is one of the best supplements in protecting the brain; (2) MCT or coconut oil – great form of saturated fatty acids that are easily digestible and helps to increase HDL (good) cholesterol levels; (3) Turmeric – contains curcumin which has anti-inflammatory and antioxidant properties and it also improves glucose metabolism; (4) Probiotics – provide “good bacteria” to help with digestion and help alleviate stress, anxiety, and depression; (5) Whole coffee fruit concentrate – triggers the growth of new brain cells and increases the connections between them; (6) Vitamin B – helps to raise hormocysteine levels which can relieve depression; (7) Vitamin D - in addition promoting bone health and calcium this vitamin protects neurons from the damaging effects of free radicals and reduces inflammation. Exercise – The more you move the fitter your brain will become. Exercise reduces insulin resistance and inflammation while stimulating the release of growth factors. Exercise also reduces stress and anxiety and improves sleep and mood. Sleep – Adequate sleep (at least 7 hours) influences our genes which dictate how much we eat, how fast your metabolism runs, how fat or thin you are, etc. On the other hand, too much sleep (more than 9 hours) is now considered a potential early marker for cognitive decline. Dr. Perlmutter is a Board-Certified Neurologist and four-time New York Times bestselling author. He serves on the Board of Directors and is a Fellow of the American College of Nutrition. He received his M.D. degree from the University of Miami School of Medicine where he was awarded the Leonard G. Rowntree Research Award. He serves as a member of the Editorial Board for the Journal of Alzheimer’s Disease and has published extensively in peer-reviewed scientific journals including Archives of Neurology, Neurosurgery, and The Journal of Applied Nutrition. In addition, he is a frequent lecturer at symposia sponsored by institutions such as the World Bank and IMF, Columbia University, Scripps Institute, New York University, and Harvard University, and serves as an Associate Professor at the University of Miami Miller School of Medicine. Dr. Perlmutter is also the recipient of numerous awards, including: the Linus Pauling Award for his innovative approaches to neurological disorders; the National Nutritional Foods Association Clinician of the Year Award and the Humanitarian of the Year Award from the American College of Nutrition. DRUGS WORSEN COGNITIVE FUNCTION Millions of Americans take medication that is FDA approved, to “treat” their Alzheimer’s disease. The problem is the very drugs that are being prescribed to treat Alzheimer’s disease are actually associated with a more aggressive decline in cognitive function. A #1 New York Times bestseller--the devastating truth about the effects of wheat, sugar, and carbs on the brain, with a 4-week plan to achieve optimum health. Renowned neurologist David Perlmutter, MD, blows the lid off a topic that's been buried in medical literature for far too long: carbs are destroying your brain. Lecturer at symposia sponsored by World Bank, IMF, etc.